Kingston was founded in July 22, 1692, as a refugee for survivors of an earthquake that destroyed Port Royal – the town is sited across the harbor (map). 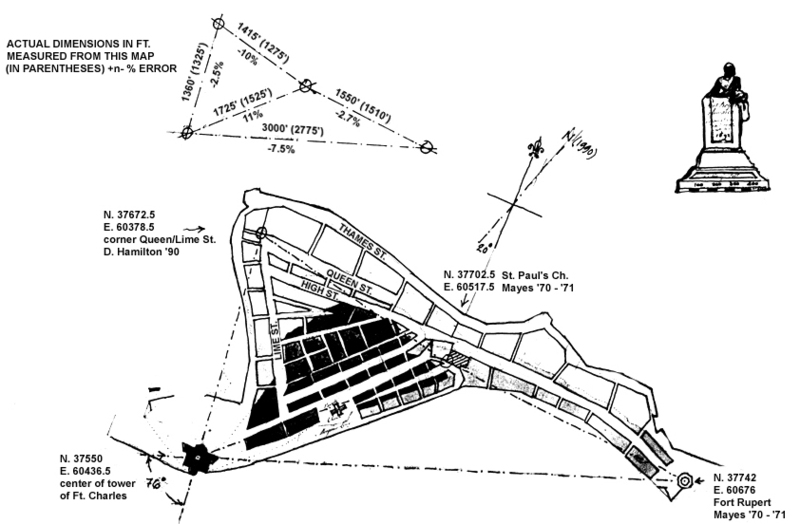 Accurate maps of Port Royal like the one below as it looked pre-1692 have been constructed from combining drawings with excavations done in the 1980s and 1990s. Before the earthquake, Kingston’s functions were purely agricultural. The earthquake survivors set up a refugee camp on the sea front. Two thousand people died due to mosquito borne diseases. The government sold land to people with the regulation that they would purchase no more than the amount of the land that they owned in Port Royal, and only land on the sea front. At the end of the eighteenth century, more than 3000 brick buildings were in the city. The harbor fostered trade and naval wars of the 18th century. Kingston took over the functions of Spanish town (the capitol at the time). These functions included, agriculture, commercial, processing, and main transportation hub to and from Kingston and other sections of the island. 1872 The government passed an act to transfer the government offices to Kingston from Spanish town, and in 1872 the capitol was transferred from Spanish Town to Kingston. 1907 In 1907, 800 people died in another earthquake, destroying nearly all the historical buildings south of Parade. That was when a restriction of no more than 60 feet was instated on buildings in the central business district. These three story high buildings were built with reinforced concrete. Construction on king street was the first area to breach this building code. 1930 Riots in the 1930s lead to the development of trade unions and political parties to represent workers. It wasn’t till the 1960s that major change occurred in the redevelopment of Kingston’s central business district. The international attention of reggae music at that time, coincided with the expansion and development of the water front area. This development lead to a influx of shops and offices, and the development of a new financial center – New Kingston, which replaced the Knutsford Racetrack. Multi-story buildings and boulevards were placed within that section. The westward section of the city was not the focus of development, and that area proved to be a tense area in political times. 1970s The deteriorating economic conditions led to recurrent violence and a dropoff in tourism. 1980s The democratic socialists were outvoted in the 1980 elections. and the Port Authority of Jamaica, along with the Port Royal Dev. Company, among others seek to develop the urban structure of the city.